Richard Beatty Anderson was born on 26 June 1921 in Tacoma , Washington. He was the son of Oscar A. and Hazel Irene (Beatty) Anderson. Richard grew up in Port Angeles, Washington, attended McClay School in Agnew, Washington and graduated Sequim High School. He was just 5' 6" tall with black hair and a ruddy complexion. He worked in the Richmond Shipyards, Richmond, California before joining the United States Marine Corps at San Francisco on 6 July 1942. 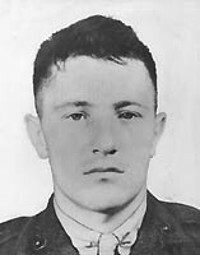 After basic training at San Diego, Anderson took his Infantry Training at Camp Elliot, San Diego; was promoted to private first class on 12 April 1943 and was assigned to E Company 2nd Battalion, 23rd Regiment, 4th Marine Division and departed the United States for Roi-Namur in the Kwajalein Atoll in January 1944. "On 1 February 1944, our company (E Co, 2nd Btln, 23rd Regiment) hit the beach (Red Beach 2) at 1200 hours in the first assault wave of amphibious tractors. Resistance was minimal when compared to Saipan and Iwo Jima. The beach was rather narrow in width approximately 75 feet and facing us was a coconut log bulwarks about 6 foot high backed by sand. This gave us some protection from incoming rifle and machine gun fire. However, parallel fire coming down the beach was taking its toll in casualties and forward movement was necessary. In the tractor group, I was the first one to climb over the retaining wall, and was shortly followed by others. Large bomb craters were everywhere from US Naval shore bombardment and shelling. A few concrete bunkers were temporarily occupied by the Japanese which were soon killed and some committed Hari Kiri." "Sometime around 1500 hours (3 PM) I had advanced about 2/3 of the way across Roi Island and found myself alone in a large shell crater. I was receiving small arms fire from enemy snipers in front of me about 300 yards away. I could see Marines advancing on both flanks and some coming up from behind me. I was shortly joined by Lt. Joseph Salome and Sgt. Joseph Kennedy and the three of us were side by side peering forward from the shell crater. The incoming fire lessened and I became aware of a new Marine who had entered the crater. Taking a second look, I discovered it was PFC. Richard Anderson, a mortar man. Why he was so far forward without his mortar crew only God knows. I always thought he came forward to observe before going back to direct mortar fire. He was a damn good mortar man and could "lay his eggs in the basket" without even using the base plate on the launcher. He was one of the few who could sight in his mortar without using the sights provided with the mortar." "I saw Richard remove his pack, lay his rifle down and remove a canister of grenades. I saw him take the top off of the canister and then I looked away. The next thing I heard was a pop and as I looked down at him I was aware he had a live grenade in his hand. This was a point of contention with Lt. Salome and myself. I maintained there was no reason for Anderson to pull the pin on a grenade while in the bottom of a 15 foot crater (with the nearest enemy 300 yards away). Where would he have thrown it? It is my belief, and God knows I've thought about this a thousand times in 53 years, that the canister had a live grenade in it, or the pin sheared, and the handle flew off and Anderson had a hot grenade in his hand. Anderson's actions at this point were nothing but heroic. He threw it backwards over his shoulder much like you would a hot potato and it rolled back to him. At this point he pulled it into his groin and said "Oh my God" as he curled around it the grenade exploded. His actions shielded the other three of us from certain injury and possible death. Lt. Salome made one tremendous leap clear across the crater and lay there shouting, "Oh my legs, my legs." Sgt. Kennedy and I went to Lt. Salome and found him to be uninjured. He immediately left the crater and went to the rear. Sgt. Kennedy and I then went to Anderson. He was in terrible shape, with both hands missing, intestines exposed, and parts of his face and chest missing. We called for a corpsman and stretcher. Morphine was administered and plasma given. He was removed to the beach and surgeons treated him as best they could. Anderson hung in there until the following morning when he died from his wounds. One Hell of a Marine!" "E Company with all of its replacements now totals about 100 men remaining. About 20 of the original 246 remain alive that made all four invasions. All are Purple Heart owners. Several won the Silver Star, several the Bronze Star, the Navy Cross, Legion of Merit and one Medal of Honor given posthumously to PFC Richard B. Anderson. They were all good men and I am darn proud to have been one of them all the way. I've always regretted I was unable to meet the parents of Richard Anderson. I have always felt he made the ultimate sacrifice for his comrades, and that I have been on loan from God to witness the horrors of war and the supreme sacrifice of young men for their country."